The Amish Hertford Windsor Rocker brings all the comfort and warmth of fine Amish furniture into your household. With a spacious seat, intricate spindlework and a chair back curved and shaped to perfection, the New England Windsor Runner Rocker is a chair to look forward to in those quiet moments you get for yourself. Dimensions: Height: 38" Width: 24" Depth: 32"
Oak~Oak wood creates a bright welcoming ambiance in any room. It is the most widely used hardwood in American furniture making. Cherry~A distinguished and celebrated hardwood, cherry wood will darken with age and develop a rich, deep patina over the years. Our Hertford Windsor Rocker makes a great addition to your living room, reading nook, den or nursery. 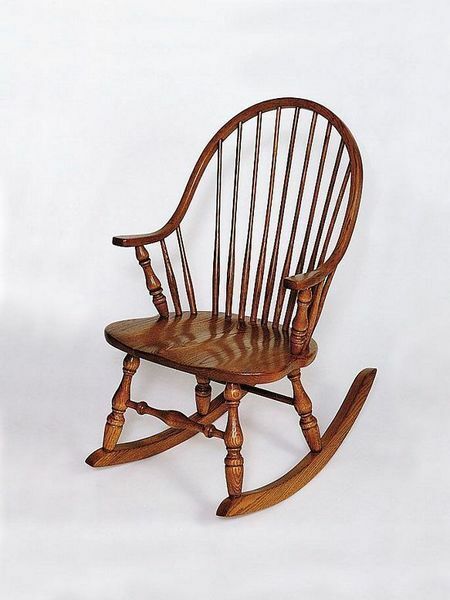 Consider our Amish Bent Wood Rocker for another option.